Strangely... Netherlands offered £20k, Spain £30k a week and France - £70k a week I am tempted to do it for a couple years, just til the next World Cup (2 years). So 1st January transfer window upon me and Giroud done nothing so put him up for sale 15mil hopefully domeone snaps my hand off Monaco are sniffing around him. The club have pumped 44mil into the kitty and im looking at strengthening. Walcott done nothing what so ever other than a double when played up top in cup against MK Dons! I have had bids and contracts accepted for Destro to replace Giroud 10mil up front and 5 in add ons. My dilemma is this..... Reus for 21mil would be fantastic signing but my scouts have recommended young Brazilian Bernard to me both attacking players im gussing Bernard could cover more positions. Whats your views and thoughts?!?! ....the FA Cup semi final, typically to a late Rooney. It was a horribly tight tactical battle, not giving up many chances to the Rooney-Falcao tandem, yet equally unable to find a route to their goal. Annoyingly the final would have been vs Middlesbrough! Utd cleaned up 3-0. In the Champions League I can blame only myself, complaceny leading to a 2nd place Group Stage finish and a draw against Barcelona. These proved two of the most entertaining games of the season. A fine 3-1 win at the Emirates set up the return leg, albeit we could have won by more. Dropped the advanced 442 to a flat 442, used two defensive wingers and hit Barca with rapid transitions. Giroud scored, we missed a host of other chances, and then the game turned. Rakitic and Messi made it 2-1 Barca by halftime, Messi added the 3rd to take it to extra time. Then it all went wrong, another brace from the Argentine giving him a 4-goal-haul and dumping us spectacularly out of the competition. Howedes stepped into the backline and dominated, rapidly establishing himself as my no.1 centreback. He also found the net 7 times, a huge set-piece threat. The entire backline did a decent job actually, perhaps only Mertesacker falling below expectations. Chambers is coming along nicely. A slow start, but looks a real threat as an occasional wingback. He is also a lunatic; 7 aggression yet he must attempt the most slide challenges in the squad, he flies into the challenge like a 2014 Martin Keown. No changes planned in this department. Mertesacker and Koscielny will continue to provide depth to Howedes, Gibbs and Monreal rotating when necessary, and Chambers covering both CD and FB as and when. I've also retrained him as a DM with a view to using him as a halfback in my occasional diamond formation. Bangaard is the 8th defender, an aerially dominant prospect. I can't see Jenkinson getting back into the squad on completion of loan. There is an excess of depth to the Arsenal midfield. Bender dominated the central area, effectively ending the Arsenal careers of both Arteta and Flamini, both of whom were injured a lot anyway. Rosicky also could not find a position and Diaby's early promise faded as I decided he didn't fit stylistically. Ramsey was the nominal partner to Bender, Wilshere rotating. The attacking two mids were a real mish-mash. Alexis Sanchez spent nearly the whole season with a succession of injuries, which initially set up Ozil for the LAM role, occasionally Podolski. However that graduated to Cazorla once Ozil had been retrained in the ST role to take up his deep-lying forward position. Nearly everyone played RAM. Walcott was almost as injured as Sanchez so Oxlade-Chamberlain stepped up. Joel Campbell was quite an effective impact sub. The story is too many options though, rarely retaining the same line-up from game-to-game as roles altered amid positional adjustments. Podolski has been making noises to leave and will be sold if I can find anyone willing to match his extortionate £100k wages. Campbell is also unhappy, again deciding he wants to join Monaco some 9 months after their interest expired! I'd like to keep him but, with an abundance of wingers, and the development of the diamond formation, his role is limited so I may cash in. Giroud was the standout upfront, his bullying physique nabbing a host of headers and 6 yard finishes. 22 goals a healthy return in a sometime-impotent team. Welbeck was, typically, a massive frustration. He misses chances for fun but does stretch opponents. Somehow, somehow, he also finished with the 4th best Goals-per-Minutes in the division, only behind Golden Boot Falcao, Player of the Season Aguero and my own Berahino, who smashed 16 in 22(10) starts for the Baggies. I am half-temped to abandon Welbeck but, continuing the realistic theme of the file, selling a young English striker who scores goals for a multi-million new acquisition - particularly when I'm happy with Giroud as the go-to man - is probably not in keeping. Either way, Berahino will be back in the squad if he impresses in pre-season to add depth. Both Walcott and Sanchez should also get minutes upfront. Ozil also had a solid campaign once he'd retrained into the DLP role. 8 goals 10 assists. All seven are up for the chop. I wanted to keep Rosicky for a tutoring and a future staff role, but he plans to quit the game. Shelving this lot will save almost £350k a week. I'm content with the squad and plan few alterations, with very small shortlists for the positions to be strengthened. The board provided a £60m kitty. A DM is a must as Lars Bender is carrying the workload and the diamond is going to require 3x CM capables in any given game. I narrowed down my options to Sven Bender and Christoph Kramer, eventually settling for a duo of Benders in my squad. Bit worried about Sven's 4x red cards, but he edges the DM role over Kramer and has the versatility to switch into the backline/halfback role. Agreed an instalment deal of £17m. I also fancied adding a dedicated LAM, given the likely departures of Podolski and Campbell, Ozil's positional shift and Cazorla hitting his 30's. I only had three targets, Marco Reus, Memphis Depay and Yevhen Konoplyanka. All were on scout the entire season. Reus is the more versatile, Depay the best longterm prospect, Konoplyanka the more suitable winger. Just before season-end Reus withdrew all interest in joining Arsenal, which suited me fine as everyone seems to have him. Depay was absolutely awesome for PSV, smashing 32 goals in 50 apps, but I went for Konoplyanka. One of my favourite players irl too. £24m upfront, rising to £32.5m for a player whom destroyed my defence in both playoff games at the start of the season. With a plan to start using a diamond more often, I also want a versatile CM to take the workload off Ramsey and Wilshere. Again, only three players are shortlisted; Charles Aranguiz, Alessandro Florenzi and James Ward-Prowse. Aranguiz is clearly the more economical whilst Florenzi seems to have that Totti and De Rossi style 'Roma love' that makes getting him tedious. Ward-Prowse's part-ability to play rightback (and everywhere else) has caught my eye. A CM with ability to play RAM or RB and with superb crossing, corners and FKs looks ideal. Can't see me doing much business beyond those three and a 3rd keeper. Just about to head into pre-season. Reinvigorated the staff department with a few extra coaches to quell the growing discontent at lack of attention during attack training. Extra scouts added, and Millwall brought into line as another feeder club. ....the FA Cup semi final, typically to a later Rooney. It was a horribly tight tactical battle, not giving up many chances to the Rooney-Falcao tandem, yet equally unable to find a route to their goal. Annoyingly the final would have been vs Middlesbrough! Utd cleaned up 3-0. In the Champions League I can blame only myself, complaceny leading to a 2nd place Group Stage finish and a draw against Barcelona. These proved two of the most entertaining games of the season. A fine 3-1 win at the Emirates set up the return leg, albeit we could have won by more. Dropped the advanced 442 to a flat 442, used two defensive wingers and hit Barca with rapid transitions. Giroud scored, we missed a host of other chances, and then the game turned. Rakitic and Messi made it 2-1 Barca by halftime, Messi added the 3rd to take it to extra time. The it all went wrong, another Brace from the Argentine giving him a 4-gal-haul and dumping us spectacularly out of the competition. Depay is awesome for my arsenal team. Really recommend him! Wow man it sounds like your season & my current one are similar - I'm currently in a horrible mid-season wobble where I have lost 3 out of the last 4 but before that I won 18 out of 22 & was playing incredibly well. How did you get out of your wobble? I find I panic and make weird tweaks to the tactics..
19 games in the league & have dropped to 6th (after being top for the most part) with 7 points separating the top 7! I retrained Özil as a DLF too but still playing him on the left as Giroud & Welbeck (my best player) have been brilliant. Have Darren Fletcher as BWN who has been alright, shows up in big-important games and is vice captain (BFG has been out for 4 months with tendonitis). Will try some different PI's and hopefully I can get through this wobble. Also, Wenger took over at Southampton in my save too. @ AndySummers - another parallel with my game and yours is, I am about to sign Konoplyanka too! I swear I'm not copying you! been scouting him since the first season and he looks great, only paying £14 mil up front too, he's unsettled which makes a difference I guess. My squad, end of December 2015. Welbz has been unreal. Mertesacker a disappointment but was out for 4 months. Steven Caulker (big fan IRL) very impressive. Hiya lads. Just starting a game as Arsenal so will be posting in here fairly regularly. Picked Arsenal because I always find myself signing young players and british players no matter what club I start with, so I figured I may as well get myself off to a good start. I will be playing a 4-2-3(wide)-1 and tend to stick to that formation no matter who the opposition. I've opted for 'Title Challenge' as my expectation but realistically I want the title. My game plan is to get rid of the older contingent and anyone who I don't think can make the grade. Will then look to bring in young(mainly English) players to build a team for the future. I always tend to get rid of players once they hit the 30 mark, except for goalkeepers. Gk: Jack Butland, Jeronimo Rulli. Cb: Eder Balanta, Phil Jones, John Stones, Steven Caulker. Cm: Youri Tielemans, James Ward-Prowse, Nathaniel Chalobah, Leon Goretzka, Lucas Romero, Gaston Gil Romero, Geoffrey Kondogbia. Rw: Raheem Sterling, Kevin Volland, Gerard Deulofeu, Jack Grealish, Adama Traore, Juan Itrube, Hirving Lozano. Lw: Marco Reus, Julian Draxler, Xerdan Shaquiri, Dorin Rotariu, Memphis Depay, Zakaria Bakkali, Josh Murphy, Pavel Savitskiy. St: Romelu Lukaku, Mauro Icardi, Paco Alcacer. Obviously I won't sign them all, but that's pretty much what my shortlist will look like. Any other signings will simply be based on picking up frees or bargains. First team players leaving will be: Arteta, Flamini, Rosicky, Podolski, Diaby, Monreal, Cazorla. Also possibly Mertesacker(too slow and almost at the magic 30). So I have lots of work to do. Will keep you updated. Personally I'd be letting an ageing Santi go and bring Isco in. Don't think Gnabry or Nathan would be quite ready yet unless their development has been rapid in your first year. I'm in a predicament in my first transfer window. I currently have Kosielny, Stones and Balanta for 2 CB spots and cant decide whether to spend £30mil on bringing Phil Jones in from United. I like to have 4 CB's for 2 slots but I don't know if I'm overpaying? That seems a bargain in the circumstances. Mine wasn't quite as high as £32.5m as £5m is an instalment after 50 league goals, which is unlikely, but that is still half-price! A £41m offer for a player valued at £16.5m and whom is anywhere between 2nd-4th choice in his position, and where the entire fee will be banked within 12-18 months. Mental! Ox had a solid rotation campaign with 22(8) apps, 8 goals and 5 assists, but I don't see how I can turn that down. With Sanchez, Cazorla, Walcott all primed for RAM, and Berahino likely in the squad the depth is there. Not to mention Welbeck, Campbell (who now wants to stay) and even Gnabry, fresh from a productive 34 apps, 7 goal loan to Norwich, who won the Championship by 14pts. Chamberlain out and Ward-Prowse in I reckon, to rebalance the midfield options. Coincidentally I had also just added the Ox's old man to the coaching staff! Season 2 will be with a 4141 DM Asymmetric shape. Keeps virtually all of the good stuff about the 4231 Wide, but adds defensive balance. You could also go for Dedé who is very good and a lot cheaper. Work permit shouldn't be problem. As right back I really really like Sebastien Corchia who is a very good player, with a very good cross. Hey man, what does that entail? Sounds interesting. I think you & I play in a similar way man, Man City are interested in The Ox on my save too & I think I would sell him as well, especially if they offer that much.. IRL I love him, one of my favourite players for us.. one thought is, you don't really need the £ and he has world class potential? Thing is I've already sold Theo, Santi, Podolski & Campbell so he's first or second choice for me. Ward-Prowse is brilliant, I had him on a save on FM14, rate him highly IRL too. I always sign his Dad as coach! How funny. Also got Tony Adams & Bergkamp back on board too. I also tweaked my tactics a bit, to the screenie below. Tbh it hasn't worked very well at all! season 2 completed, been very interesting and enjoyable attacking football. Also dude, don't forget, The Ox has a 25% sell on fee (of the profit) that goes to Southampton.. which works out as approx £7.25 mil going to The Saints. I don't know why I always end up doing it, but I'm ruined for choice in the centre of the park. GG Romero, L Romero, Pogba, Ramsey, Wilshere, Kondogbia, Tielemans (out on loan) are all competing for 2 CM places in my main formation, get's even worse when I swap formation and have one CM! I'd guess the three playmakers are the problem? Naturally they wander to find pockets of space, so that could leave an imbalanced team shape, particularly with the use of a roaming playmaker too. I'd be interested to see an 'average positions' graph from one of your games! I reckon you'd have more joy by tightening up the centre or, if you have your heart set on a roaming player, perhaps dropping one of the widemen back to support the midfield / act as a defensive winger. Paid just over £5m back to Southampton as part of the Ox deal. He has basically just paid for Ward Prowse and Bender. Negotiated the initial offer up to a round £42.5m, and also included Tosin Adarabiora, a 17 year old English centeback. Doesn't look much yet ,but has potential. I wanted to try and snag Kelechi Ihenacho instead, but he is out on loan and unable to trade. I'd guess the three playmakers are the problem? Naturally they wander to find pockets of space, so that could leave an imbalanced team shape, particularly with the use of a roaming playmaker too. I think you're right, I have since binned that tactic. No clean sheet since playing League 1 side Blackpool in the FA Cup! 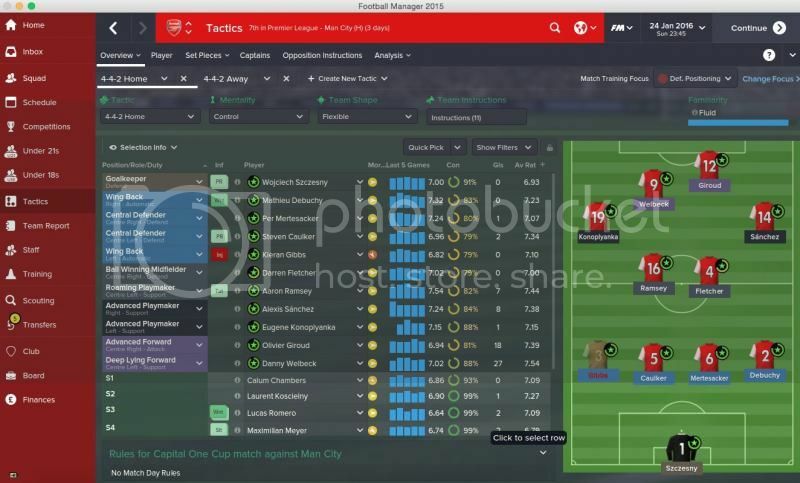 @AndySummers - what tactic are you using for your second season so far and how is that going? I don't know if it's my tactics or the match engine. But it's really getting cheesed off with the goals I'm conceding. Every single one of the goals scored against me either comes from a corner to the near post or from a brilliant long range hit. And I have no clue how to stop either. The long range ones, I can deal with. But the goals I'm conceding because of balls hit into the near post from corners is ridiculous. I've got someone marking both the near and far posts. Yet, it doesn't work at all. Can someone help me please? Having a really frustrating time of it at the moment. Was coasting to the title, but in the last few games we've lost to Stoke and drawn against Watford, both at home, and lost to a relegation threatened Southampton away from home all because we can't finish. Looking likely that I'll be next in line to bottle a league title. IEvery single one of the goals scored against me either comes from a corner to the near post or from a brilliant long range hit. And I have no clue how to stop either. The long range ones, I can deal with. But the goals I'm conceding because of balls hit into the near post from corners is ridiculous. I've got someone marking both the near and far posts. Yet, it doesn't work at all. Can someone help me please? Asking one or two players to 'zonally mark six yard box' will sort this out, as they cover the near post. I had the same issue as yourself and conceded no more than twice for the remainder of the season after zonal. Marking near post will only have a player actually on the goal line, but they don't attack the ball. Thank you so much! I'll give this a shot and report back with the difference. Can you please help with the entire defensive setup for corners and free kicks if possible? I've started a new save now. The old one got annoying because of this issue. 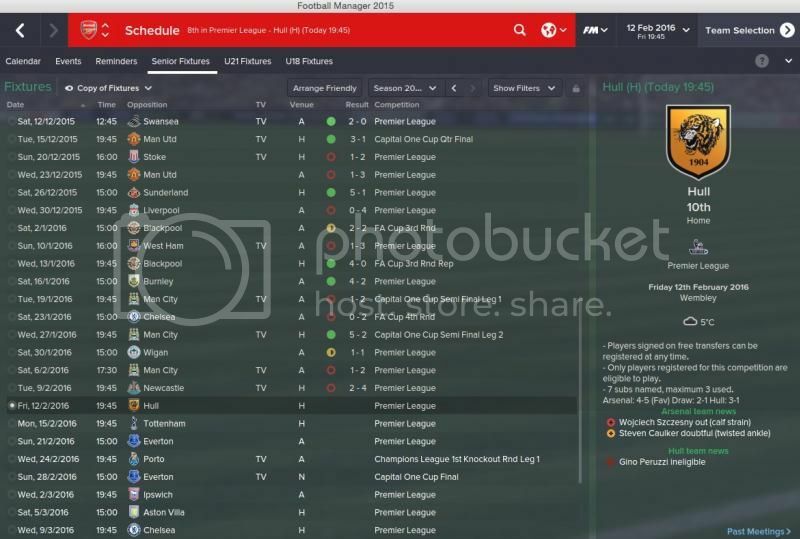 Mostly down to me though because I made the same mistake as Wenger irl. Signed too many technical players but not enough defensive cover. I'm kind of glad I'm not the only one, sorry man. This second season is turning out to be the worst I've ever had as Arsenal boss on any FM.. 7th in the league, have got the Carling Cup Final next though, fingers crossed hope your season turns round dude. What season are you in re the possible takeover? Not that dissimilar to real life really. I have the chance of signing Sterling for 57 million Euros. What should I do? I'm in the first season. Totally off-topic in regards to your post, but I remember you praising Oxlade-Chamberlain and he has started the second season on fire for me but has dipped in form just as quickly. Just wondering have you seen this too? I realise he's still young and maybe just inconsistent. He's currently playing AML as a Raumdeuter where he got 5 goals and an assist in his first 3 games but his last 5 games since has seen a 6.76 average. I play a possession based 433 with him, Walcott (Winger-support) and Sanchez (False 9-support) the other two playing in my attacking 3 all set to Roam from Position. Might simply switch him and Theo or how are you playing him? WillyBroadband - if you are struggling that badly with results, confidence will dip. If your confidence is low, then it will be hard to pull off an aggressive, attacking game. Get a more solid shape in (4-1-4-1 for example), and try to start battling your way to some wins. 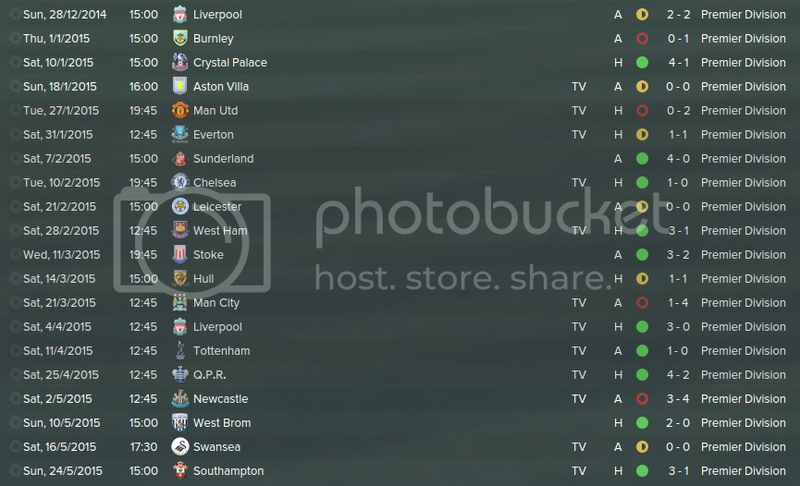 After 16 league games I have only conceded 6 goals. I often take points when I play badly, because we have the shape to ride it out, and the players to punish opponents. Kieran Gibbs you are playing out of your skin. 34 games, 8 goals, 5 assists average rating of 7.53 in all comps. @llama3 - you're right man, from the screenie below I did just that (but not 4-1-4-1) as you can see my results have got better, I started using a more solid tactic from the 2-0 home win against Hull. Now I've played 11, won 7. Thinking about doing a 4-1-4-1 for my third season though. I don't think there is any great secret to defending corners. Personally I like coverage, a player on each post to narrow the range the GK has to save within and also deal with the occasional poor corner. I'm not a fan of zonal marking per se, so there is a man marking structure, with just the one or two zonals to cover the near cost corner issue. I am a big fan of leaving two players forwards, forcing opponents to leave an extra defender back and clearing the penalty box for the keeper. That is why I only have three players man marking, with two dedicated to the posts. One player on the edge of the area to spot 'penalty box' type corners and also pick up scraps. The main element I'd point out is to ensure you have the correct players in their jobs. Your best markers man marking, hoping they will outweigh opponent off-the-ball attributes. And also any decent aerial players back. For example, one of my zonals above shows as Ozil, but that is actually the position Giroud occupies in the usual team. I think this is quite an underrated element of defence. I suspect a number of managers set up their routines and wonder why they concede, but on closer inspection have some unsuitable players doing certain jobs (or fill their team with small technicians and forget the impact it will have on set piece defence). In my normal set-up, you would see Mertesacker and Howedes marking tall players, Bender man marking, Giroud and my other best aerial player on zonal. Two smaller quicker players left upfield ready to counter, although FM doesn't seem to model countering particularly well on corners, and invariably the ball just gets hoofed upfield. The FK defence is quite basic. 3-man wall with the entire backline man marking. One player covering a post this time, with another 'extra body' back, leaving one player up the pitch. Thank you so much once again! That really helps! The zonal marking has definitely helped tremendously. Not conceding a lot from there now. The long-rangers are killing me though! Quick question - you've got your full backs marking the posts. Now, I don't have a very tall side unfortunately. I've got a flat back 4 with by full-backs going traditional. No attack, all defence. That means, I've got Balanta as my starting left back. He's got great man-marking & decent concentration. 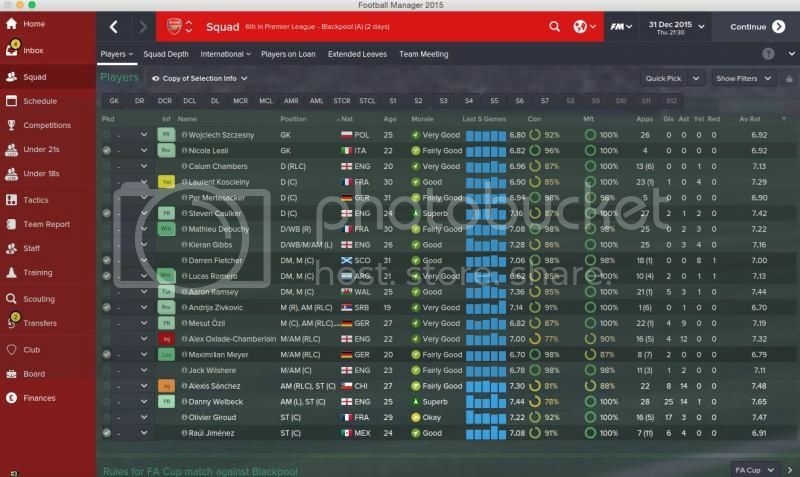 And on the other side, its Debuchy & Chambers who are also decent in air. My question here is - is it necessary to have defenders on your posts? 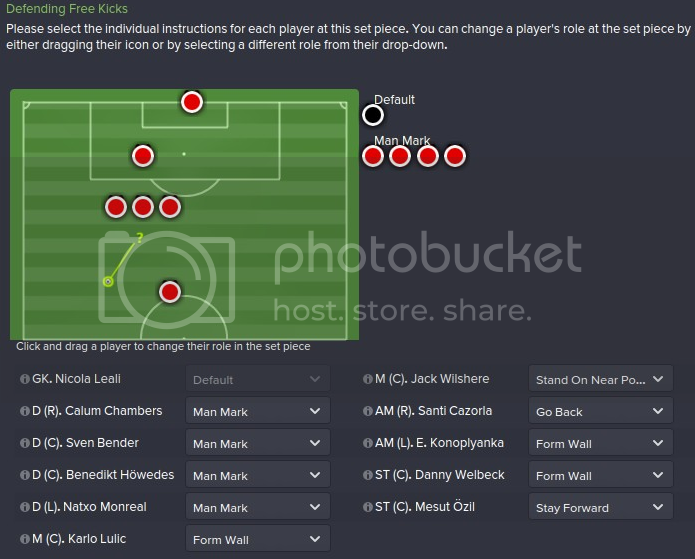 Or can I leave the shorter guys like Cazorla & Ozil there and leave my full backs to man-mark/zonally mark instead? My question here is - is it necessary to have defenders on your posts? 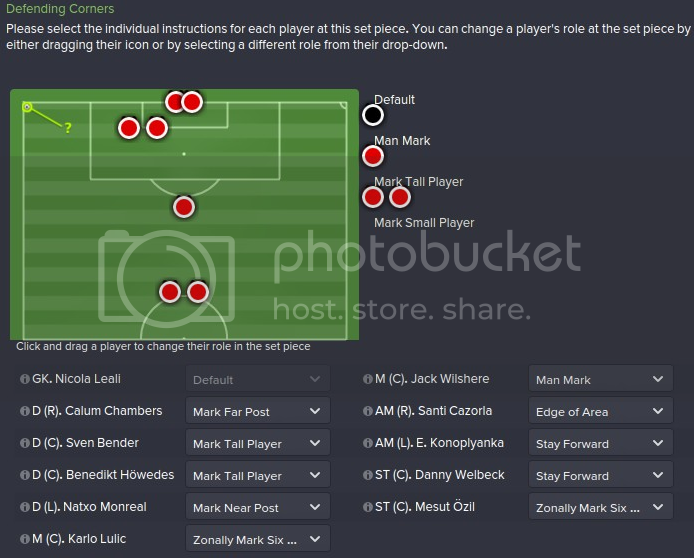 Or can I leave the shorter guys like Cazorla & Ozil there and leave my full backs to man-mark/zonally mark instead? I'd say anyone; essentially the player is just a body in place to thwart attempts into the corners. Perhaps concentration might be the key attribute? This is the best example of the corner defence, actually just occurred in my very next match. Cleared at the near post zone, Wilshere (the best ballplayer in the team, edge of box) picks up the scraps and launches a 60 yard pass to Walcott in space. Only a lack of vision stopped a one-on-one for Welbeck. Won this pre-season game 0-6 with the 41212 diamond. Loving the way this formation plays, it is absolutely deadly on the counter. Has anyone tried Ramsey as a Roaming Playmaker? He has been playing well for me as a box-to-box midfielder but my defence is wide open with 2 MCs and the opposition is constantly getting in behind. I'd like top drop my MCs to DMC but B2B Midfield is not available from DMC. What are the roles you have set your side up with on the 41212? 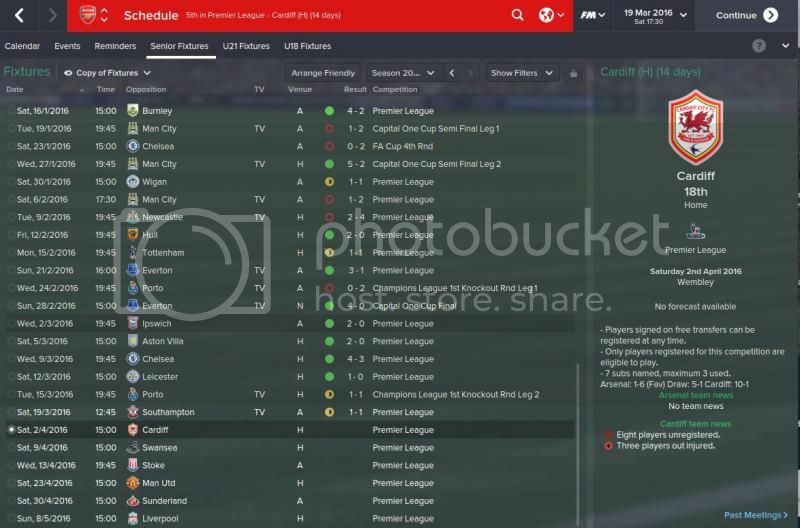 I think this is going to be the way I bring the interest back to my Arsenal save. Thanks for all your tips. My team's definitely defending better off corners. And leaving 2 men upfront, while it hasn't resulted in any goals just yet, I'm certain it will do soon. I've had a lot of fast breaks in my first few friendlies but the end products been messing. I reckon that should get better once my team gets more familiar with my tactics. Yep, that's what I use him as, he's been very consistent for me. 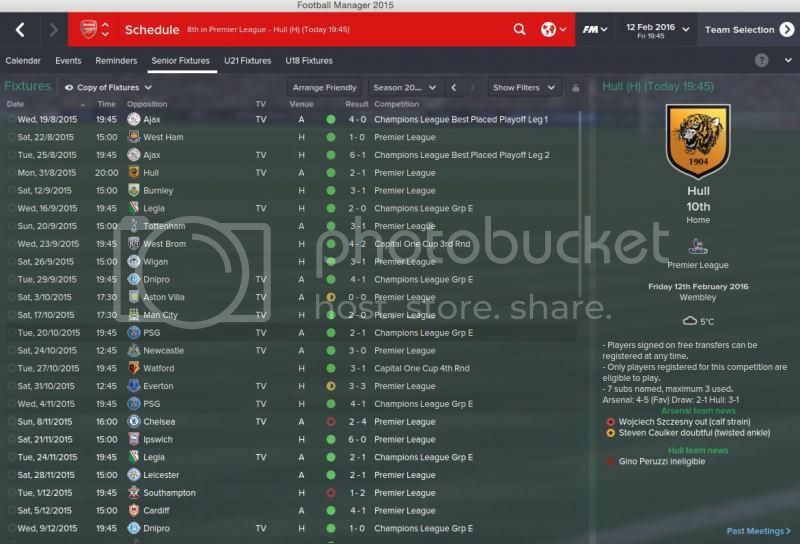 I'm in September 2019 myself, took over Arsenal after the second season. 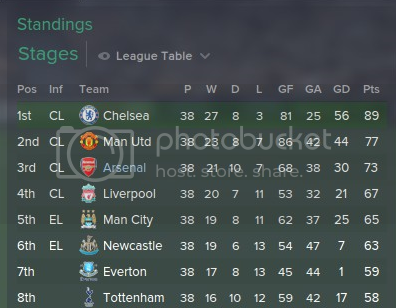 No luck in the league so far, Chelsea are dominating, but won the Champions League in my first season, plus one FA Cup and the World Club Championships. The board has been remarkably patient, I expected being sacked after finishing 6th but somehow survived. Just when I thought things were going to go south, I'm on the verge of a quadruple. Won the COC earlier, now just need one more win in the league to retain the title, and face Chelsea in both the FA Cup and Champions League finals. I've had a £21 million bid - £12 million plus £9 million for his agent's 40% stake - accepted for William Carvalho. I'm quite torn as to what to do. I've received excellent scout reports from Steve Rowley, but I do feel a more mobile, more versatile (in terms of role) holding midfielder - see: Morgan Schneiderlin, Christoph Kramer, Saúl Ñiguez, Sergi Samper - would be a better option for my Arsenal side and my 4-2-3-1 formation. By the way, please don't recommend Lucas Romero. UPDATE: The consortium was lead by ex-Southampton director Ralph Kreuger, but he didn't have the sufficient funds to complete the takeover so they've now pulled out. The transfer embargo has been lifted, but now another consortium have registered interest. If a takeover happens, I really hope it's not going to be a "sugar daddy" type thingy. Don't want to become another Chelski or ManC. Arsenal is a proper football club.